It seems that I often refer to the superiority of the overhead valve engine design as compared to the side-valve or “flathead” engine design. My day job is as a consulting engineer (although not in the automotive industry) so I have an engineering interest in the technical aspects of automotive design. As a result, I thought that I would try to further explain some of the technical aspects of automobile design and performance. In North America, the most common, or at least the most famous, side-valve engine was the Ford side-valve V8 or “Flathead” V8 that was in their North American cars from 1932 to 1953. As can be seen from the above image the name “Flathead” came from the rather flat exterior surface of the cylinder heads. 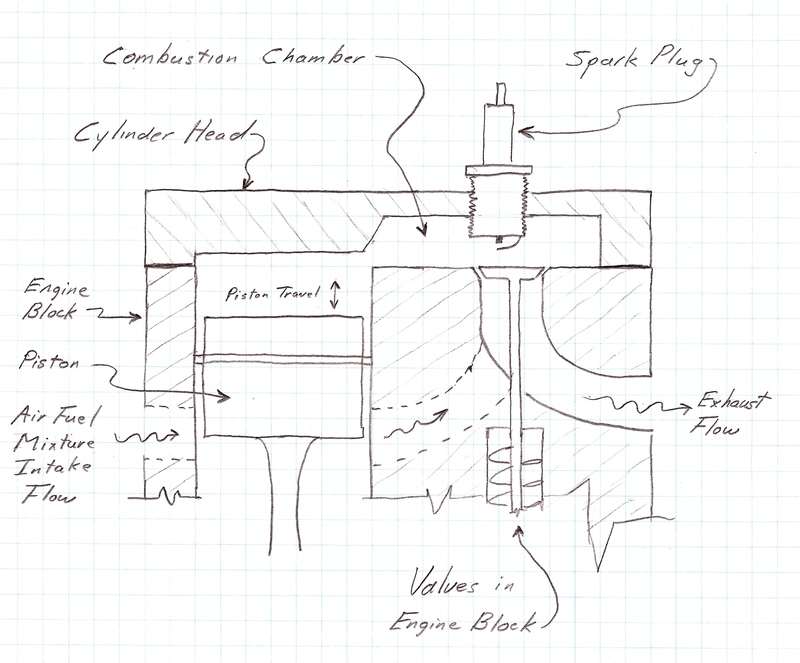 In order to try to explain this engine design, I have prepared the following sketch of a side-valve engine design. As can be seen from the above sketch, in a side-valve engine design the intake and exhaust valves are located in the engine block – not in the cylinder head. As a result, there is very little in the cylinder heads other than the spark plugs. The cylinder head that I have shown in the above sketch is typical of a slightly high compression side-valve design. Typically the top dead center of the piston travel in these engines is right at the top of the engine block. For my sketch, I have shown a reduced clearance between the roof of the cylinder head and the top of the block in the area of the piston. Many side-valve engines do not have this clearance reduction and the roof of the cylinder head is at a common distance all across the cylinder head which reduces the compression of the air/fuel mixture compared to what I have shown. With the cylinder head design as I have shown it in the sketch, during the compression stroke the intake mixture is forced into the cylinder head volume above the intake and exhaust valves and directly in the spark plug area. By compressing the intake mixture in the location of the spark plug, the burning of the fuel mixture is enhanced. The purpose of automotive engine design is to convert the energy in the fuel into energy that can be used to move the car forward. So, in general, the more volume of fuel that you can burn and the faster that you can burn it, then the more power that the engine will produce. The disadvantage of the side-valve engine is that the air flow characteristics of the design are far from optimal. On the intake stroke, the intake valve will open and the suction caused by the downward movement of the piston will draw the air/fuel mixture into the cylinder and cylinder head. The intake air/fuel mixture flow path is not smooth. The flat surfaces and internal corners are not conducive to good air flow. There are too many obstructions that cause turbulence and air flow eddies that impede efficient air movement. The same thing happens during the exhaust stroke as the spent air is not efficiently removed from the cylinder head. Any spent air that remains in the cylinder during the next compression stroke takes up space in the cylinder that should be occupied by the air/fuel mixture. This inefficiency of air flow is not a huge problem at low engine revolutions, but if the engine designer wants a higher revving engine, then one of things that has to happen is to get the air flow mixture into the engine as fast as possible and get the spent air/fuel out as quickly as possible. This is a problem in a side-valve engine design. Another problem with the side-valve engine design was that after World War II, the available fuel had a higher octane rating. To use this fuel efficiently, it is necessary to increase the compression ratio. In order to increase the compression ratio, the distance between the top of the engine block and the roof of the cylinder head is reduced. This reduced height between two flat surfaces further impedes air flow. The basic engine design did not allow the side-valve engine to take full advantage of the newer fuel. The other negative feature of the side-valve engine design is that the air/fuel mixture has to reverse flow direction for the intake and exhaust strokes. In my sketch above, it can be seen that the air/fuel mixture moves from right to left during the intake stroke and from left to right during the exhaust stroke. In future postings I will show how the air flow is improved in other engine designs where the intake and exhaust valves are located across from each other. If you look carefully at the above engine block, the intake manifold, and the exhaust manifold you can tell which of the valves are the intake valves and which are the exhaust valves. Note that the relative position of the valves changes along the engine. In upcoming posts I will also discuss the merits of various types of the intake and exhaust manifolds. The important thing to remember about side-valve design engines is that they are suitable for low revving engines, but as the need for higher speed engines increased and as the available fuel became better, the side-valve design was surpassed by other engine designs. great little read. i hear finding a crack free block is a hard task. hopefully (fingers crossed) i won’t need to replace my flathead anytime soon. That may be true, but I have not heard that before. Generally these are low revolution and low compression engines which would seem to result in a rather low stressed engine. I am surprised that crack-free blocks are hard to find. What is the size and make of your engine? mine is a 255ci 1953 mercury. i guess hot rodder’s tend to treat these engines a little harsher, don’t keep an eye on the cooling system as they should — resulting in overheating and cracking. also climate may be a factor, being in australia our summers can be very hot. Good points Tony. Your response got me thinking about the engine components that could impact the cooling system, such as water pumps that might have been designed and built back in the 1930s. The real problem might not be with the engine block itself but with other components not being up to the job. I concur, Steve. Engineers during the flathead era had limited research and development tools and getting reliability was often a challenge. 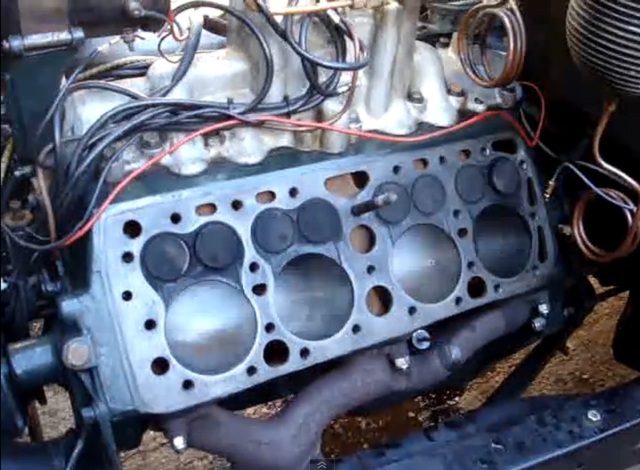 The earliest flathead V8 Fords had serious problems, including excessive oil use. Oddly enough, the first of the new-era 1955 Chevrolet OHV V8 engines had the same problem, plus the longer term issue of no oil filter. I believe one was optional. That soon changed, and the engine became better filtered and better at conserving oil. I don’t understand this statement. Some modern engines (eg VW’s 2V diesel and petrol engines used a contraflow arrangement whereby the exhaust gas flow is in the opposite direction to the intake flow. In terms of flow there’s little real benefit to the crossflow arrangement. The side valve arrangement has some important advantages over OHV layout. A direct acting valvetrain can be easily employed which has greater rigidity-and is considerably lighter-than a pushrod operated OHV system-so faster ramp rates can be utilised on the cam lobes. Placing the exhaust port in the block allows for a faster engine block warm-up which is important since most of an engine’s friction in the cylinder block/crankcase rather than the cylinder head. A further benefit of keeping intake and exhaust ports out of the cylinder head is that the task of keeping a tight seal between the cylinder head and the block is simplified. Finally, the overall package of the side valve layout is incredibly compact-even compared to the space efficient OHV layout. As you you have pointed out, the combustion chamber geometry is pretty awful-especially if a decent compression ratio is desired. Also, the upturned inlet valve requires that the intake mixture be virtuallly entirely gaseous prior to entering the cylinder.But rather like the 2 valve vs 4 valve debate, the overall advantage isn’t as clear cut as it might first appear! Let me explain my thinking behind the statement: “The other negative feature of the side-valve engine design is that the air/fuel mixture has to reverse flow direction for the intake and exhaust strokes.” When the intake air/fuel mixture passes through the intake valve the mixture has to make a 90 degree turn toward the piston, then take a 90 degree turn to fill up the cylinder volume. While this is going on, if their is overlap between the intake and exhaust valves then exhaust gases are flowing in the opposite direction toward the exhaust valve. The flow of the air/fuel mix has to do a 180 degree turn at the piston surface to exit the cylinder chamber, followed by the two 90 degree turns to get out through the exhaust valve. This is the reversing of direction that I was referring to. I realize that this happens in an overhead valve engine, but I think to a lesser extent. I guess that we’ll have to agree to disagree about the benefits of crossflow heads. Thanks for taking the time to reply. I can fully understand where you’re coming from with regard to the tortuous path during gas exhange. But I’m not sure that it is a major hurdle at the relatively slow speeds that flathead engines are designed to operate. Poor gas dynamics was not the only stumbling block that prevented pre-war designed engines from high speed operation. The metallurgy and production tolerences simply weren’t up to the job. If you look at the OEM 1950’s OHV conversions from side valve engines, they aren’t significantly more powerful. Only when the undersquare geometry was changed to big bore/short stroke designs did the power levels start increasing. The reason I dismissed the advantage of crossflow heads is that they only exhibit an advantage during valve overlap when mated to an effective exhaust scavanging system ie headers. For emissions reasons modern engines have very little valve overlap and a small volume exhaust manifold coupled directly to either a catalytic converter or a turbine. Exhaust scavenging just isn’t as relevant as it once was. Again thank you for your thoughtful comments. I agree with what you have said. At low engine speeds, the head design is of lower importance with respect to air flow. It is only when the number of cubic inches of air/fuel/exhaust that has to be moved through the same size of cylinder is increased that air flow becomes a bigger concern. And I agree that turbocharging (or supercharging) increases the inlet air pressure which means that air pressure losses due to a more tortuous path can be overcome. The flathead design was never fully optimized due to its inherent limitations. Still it is fun to speculate on what could be done. Professor Blair of Ireland theorized that a three-valve flathead (two intake, one exhaust) would produce more power than the normal two-valve. He has some diagrams here: http://www.profblairandassociates.com/GPB_4stHEAD_SideValveHeadLayout_3vinput.html. Cadillac produced a flathead V16 engine from 1938 through 1940 or ’41. It had well designed ports for a flathead and made as much power as the larger displacement OHV V16 that it superseded (431 Vs. 452 cubic inches). As a thought experiment, consider a sixteen cylinder, three valves per cylinder engine. It would have 48 valves which would go some distance to reducing the power margin potential of modern OHC engines. With 48 valves, variable vane turbocharging, optimized inter-cooling, variable valve lift and timing, and other traits of modern engine technology, impressive power could be had, A high displacement engine of, say, 500 cubic inches could plausibly exceed 750 very civilized horsepower. I should have said variable INLET vane turbocharging. Once seldom used in gasoline engines due to high temperatures, it is now beginning to be used in high priced sports cars. The industry went the wrong way in the development of piston engines for continuous duty. The development of gasoline was unnecessary. Automotive engines must be economical at 20% power, which compels the compression ratio of the basic engine to be as high as possible. Diesel engines are economical in automotive applications because a direct injected diesel has no throttle and runs at full manifold pressure even at idle power. Boosting the manifold pressure of the engine requires the compression ratio of the basic engine to be reduced, which reduces the efficiency at low power settings. For piston engines that operate at continuously high power settings, the compression ratio should be minimized to allow the maximum amount of boost and inter-cooling. The greater percentage of compression ratio that is developed in the supercharger, and the lesser compression that is developed by the reciprocating expander, the more efficient is the engine package at sustained high power settings. If the heat of compression is removed, a spark-ignition engine can operate at higher compression ratios than are current used. Spark-ignition engines can be operated at 10:1 compression ratio if the centrifugal supercharging and charge-air-cooling system develops 5:1 compression and the reciprocating engine develops 2:1 compression. Manifold pressure at full power would be 150 inches of mercury. The 400oF discharge from the impeller is reduced to 150oF in a cooler before proceeding to the engine, where the charge air is compressed 2:1 by the engine. The resulting temperature (300oF) will be too low to detonate the fuel, as shown in the calculations below. The auto-ignition temperature for gasoline is 500 °F. The auto-ignition temperature for diesel is actually lower, at 400 °F. Gasoline would no longer be needed for reciprocating engines. This engine would be immune from pre-ignition/detonation, as opposed to today’s entrapping “gotcha” reciprocating aircraft engines that are a nightmare of pit falls that easily destroy today’s engines by pre-ignition/detonation. The warranty claim for an engine that has been destroyed by high ignition timing and/or low fuel flow is always summarily denied. Applying take-off power with the mixture on “lean” can end your day, and sometimes your career. At $300 per horsepower, there must be a better way than the confounding engine operating limits that apply even during the most demanding night-time instrument flying in turbulent icing conditions, complete with frequency changes. The supercharger would be packaged as a close-coupled unit with an 8:1 step-up gear drive. A 2-speed blower drive would not be necessary for unpressurized general aviation aircraft. The reciprocating engine is a conventional horizontally-opposed piston layout that can be built in 2, 4, 6, 8, 10, or 12 cylinder versions displacing from 100 cubic inches to 600 cubic inches. A low-compression piston engine is best configured as a twin-cam “Tee” head engine (similar to an “L” head engine) with inlet and exhaust valves on opposite sides of the cylinder. The valve diameter can be as big as the piston diameter. The combustion chamber volume is equal to the swept volume of the cylinder to achieve a 2:1 compression ratio. The traditional shortcomings of flat head designs (overheating and breathing) are overcome with well-cooled boost pressure and with a cross-flow head design that is better than previous flat head designs that featured both valves on one side of the cylinder. The exhaust gas temperature will be well below “normal”. Sophisticated gasoline fuel with tetraethyl lead (anti-knock) and ethylene dibromide (to scavenge the lead) will not be necessary. It’s a spark-ignition (or glow plug) engine that does not need gasoline fuel. The head bolts are shown extending down to the crank case, such that the engine is “post tensioned” together. The strength of the head is calculated across the short span of the combustion chamber, which is equal to the cylinder bore. Flat heads have worked well (structurally) throughout their long and storied history. Flat head engines are easier to manufacture and require a smaller support parts inventory. A supercharged, intercooled, low-compression flat head engine is a cost effective general aviation engine that runs on non-gasoline fuel. A “high tech” solution is achieved with “low tech” components. This engine would also work well in marine, industrial and hybrid applications where only high power is required, and where low-power economy is not a consideration. In the beginning, before gasoline was invented, internal combustion engines were fueled by oil. The compression ratio was 3:1 to prevent the heat of compression from detonating the oil. In the illustration below, the propeller is driven by the camshaft, as opposed to the crankshaft, because the camshaft rotates at ½ the speed of the crankshaft. This will allow efficient, quiet, multi-blade, slow-turning propellers, as opposed to today’s high-speed 2-blade noise-makers that create an ear-splitting racket. Flatheads worked great when heavy cars driven at relatively low speeds needed low-end torque to move them from a stop, more than the highest maximum horsepower, plus with no automatic transmission, torque minimizes shifting; and they were less complex and easier/cheaper to manufacture. One disadvantage of the Ford V-8 design is the long exhaust passages through the cooling jacket, to get the exhaust out of the outside of the block (rather than having the exhaust manifolds in the valley with the carburetor and intake manifold). This put a lot of heat into the cooling system at high outputs, and often is the cause of overheating complaints, especially if the cooling system is in less than perfect condition. People have blamed overheating at high loads/speeds on “water flowing through the radiator too fast” and I have heard and read all sorts of variations on this theme, none of which are valid. Fact is a lot of the exhaust heat is getting in the coolant and must be carried away. Concur. The flathead Ford V8 may have been the worst-possible engine design for power boosting. And many were turbocharged by hotrodders. The thermal stresses around the center exhaust port and surrounding cylinders must have been enormous. My neighbor has a stock older Ford V8 car. It is a quiet and sweet-sounding engine. The theoretical disadvantages were unobtrusive in normal driving of these old carts. If the compression & breathing problems of side-valve engines had been overcome some other way than with overhead valve systems, then even modern piston engines would still be some side-valve design. The compactness and low production costs of side-valve engines would have ruled out OHV, OHC and DOHC. Instead, those were invented early (1919 DOHC patent by Louis Chevrolet) and engine industry already knew what to do when a side-valve design would not offer enough power and fuel efficiency. Because a decent answer to the problem was known, the industry followed that path. Fiat and Alfa-Romeo were using DOHC engines before WW1. It is interesting to speculate on which engine–flathead or Overhead cam–has the highest power potential per exterior package volumen. My guess is that the OHC engine would win, but surely by a smaller margin than when only internal displacement is considered. New flat head engines are still being designed for light aircraft. They are used because they are light, reliable and give excellent fuel economy. Most people also (incorrectly) think that a smaller engine always uses less fuel. So buyers will buy models with smaller engines in the (false) belief that they will save fuel. In reality the same car will use about the same amount of fuel whether it has a small engine or a large one. That makes it hard to sell a large engine even if it has equal or better fuel economy. Car design has also been heavily influenced by racing developments such as DOHC and variable valve timing (even though race engines and road engines have diametrically opposed goals). It would be virtually impossible to sell a ‘low tech’ flat head engine even if it it was superior. So, how do you explain the recent surge in alll kinds of mini 3 cillinder engines then? europe is flooded by small 3 cilinder designs lately. i’d rather have a 3 liter 6 in line, but can they archieve the same fuel efficiency with a 6 in line 3L engine then? Another problem with flatheads was cooling. This was partly caused by the exhaust passages being in the block itself, between the cylinders. On top of the poor scavenging, the exhaust gases not only couldn’t be cooled due to the absence of water galleries, but also added to the heat inside the cylinders. Also, the Ford flathead V-8, as you probably know, was the first attempt at casting a V – block in one piece, and some compromises were taken with water and oil passages. The most amazing fact about the Ford V8 is that Ford engineers were able to produce it cheaply enough for profitable sale to the masses. 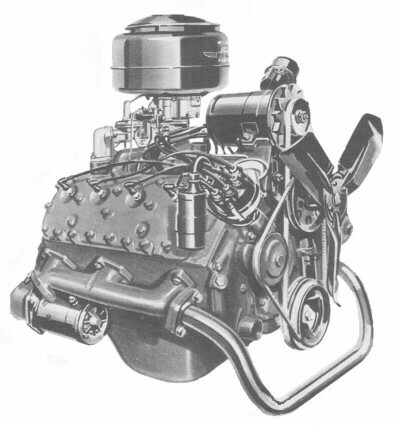 That said, the later 1938-40 Cadillac flathead V16 engines had far superior porting design, so excellent that Arthur Judge showed it in one his several engine design books as an example of good port design. By the way, which book is that? Nikolas, the book is “High Speed Internal Combustion Engines by Arthur William Judge A. Sc. It came in many editions, along with other high quality auto engineering books by the same author. Yes, it was not uncommon for special aftermarket heads, Ardun heads, to be added to Ford flathead engines to change the flathead engine to an overhead valve engine. You can find out more about this by referring to a post on this website that I made on September 15, 2012. I believe that I have seen an overhead valve conversion on the four-cylinder Model A engine, but I can not remember the details. I wish Ricardo was still around to answer for side valve design. Noone has mentioned his squish head design that revolutionized side valve engines. Ricardo said, in his wonderful book on engine design, that the F head was the closest thing to an DOHC without the complications. Anyone (including me) who has raced an early Coventry Climax engine with the Morgan modifications has some idea what an amazing design this is. During the 1950’s Harley Davidson engineers had “perfected” their design of the 45 cubic inch (750 cc) flathead engine for the AMA racing series. They had raised the power output to one horsepower per cubic inch @ approximately 7000 rpm which is amazing in and of itself for such an archaic engine design. However the sanctioning body limited the overhead valve engine motorcycles to 500 cc in the same racing events to level the playing field for the flatheads. In other words it was a lot easier for the OHV engines to reach the 45 horsepower mark than it was for the flatheads at the time. The Harley racing flathead also used regular fuel, according to one report I read. Perhaps the extensive valve opening overlap kept actual pressures below the modest knocking resistance of the combustion chamber shape. I believe the 1955 Chevy had chrome rings which tended not to seat properly. My friend had one and we “drove it like we stole it” right off the showroom floor. Never burned oil despite incredible abuse. Your drawing is wrong mate. Intake and exhaust around the wrong way. Exhaust goes through the block through ports not air/fuel mixas per your drawing. You’re right, Mick, that the Ford V* exhausts through the block. Also, between cylinders on the center ports. It is a thermally poor design that channeled hot exhaust by already thermally stressed pistons. Amazingly, the Ford V8 my brother bought new ran like a charm for over 100,000 miles and used little oil. Cadillac and Packard V engines used a better system where exhaust ports came out in the V. the German car makers are now making so-called “Hot Vee” engines where the exhaust exits into the engine V area where they can centrally feed into turbochargers. I always wondered if modern ideas and materials could resurrect the flat head. Especially when I learned that my enthusiasm for overhead cams should be balanced by the idea that an “old technology” pushrod engine can be more compact and lighter. An advantage of the flat head would be lower center of gravity, would it not? Or in a boxer motorcycle engine would result in a narrower engine, and that might have some advantages. A lower center of gravity is important. You mentioned the boxer motorcycle engine. Engines like that design are favored in some motorcycles like the Honda Goldwing. Their flat engine design with its low center of gravity is an example of a motorcycle with a large engine that is still very easy to handle. One of the early disadvantages of the flat head engine was the inability to use high compression ratios because doing so tended to restrict air flow between the valves and the cylinder. All because the top of the high compression ratio combustion chamber came closer to the engine block. But a highly turbocharged engine can achieve part of its compression by means of the charger mechanism, turbo or super, thus somewhat alleviating the need for a very high mechanical compression ratio. Perhaps the future would be a camless engine design. Something like the Koenigsegg free valve engine.This would as compact as a pushrod engine without its drawback ( less mechanical parts and high revving ability).